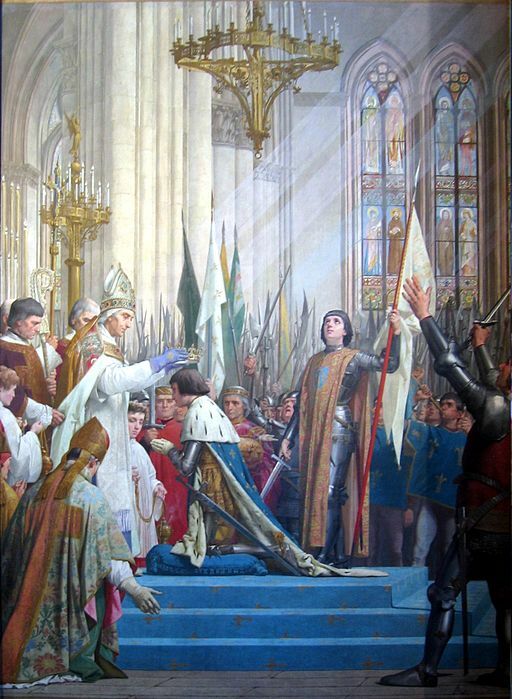 Charles VII (1403-61) was the French king who could have saved Joan of Arc from being burned at the stake but refused to do so. The story of Joan of Arc is a well-known one. She was a young peasant girl who became convinced that she could turn the tide of the war against the English to ensure that Charles would be crowned king. She claimed to have had visions that made it clear that God was on the side of France and would ensure that the English would be expelled. Charles took some convincing, but Joan’s insistence gave him the courage that he lacked. He lent her an army of 3,500 men and sent her to lift the siege of Orleans, which she did. She then proceeded to win a series of victories that opened the way to Rheims, which was the traditional coronation site for French kings. 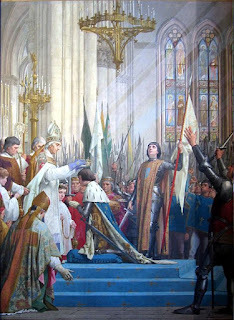 Charles was duly crowned in Rheims Cathedral on 17th July 1429, with Joan standing at his side. One might have thought that Charles would have done everything he could to show his gratitude to Joan, but this did not turn out to be the case. When the Duke of Burgundy, who was Charles’s arch-enemy and an ally of the English, offered a truce, Charles accepted it as an alternative to continuing the fight that Joan had started. If Joan had visions of sweeping the English out of France, Charles appeared to have stopped believing in those same visions. Not long afterwards the Burgundians captured Joan and demanded a ransom for her release. Charles made no moves to raise the necessary funds, so Joan was handed over the English who proceeded to put her on trial for witchcraft and heresy, then condemn her to death by burning. Charles’s weakness in this matter did his reputation no good at all, either at the time or in retrospect. Having used Joan to get what he wanted, namely a crown on his head, she was expendable. It did not look good for a king to be indebted to a peasant girl – at least, that appears to have been his thinking. Charles did, 25 years later, support an appeal to the pope to reconsider the case against Joan and nullify the verdict, but that was far too late for the girl who, at the age of 19, had been reduced to ashes that were then sent floating down the River Seine.